Mrs Katie Oruwariye was born in London in 1916. She died in Ibadan, Nigeria on 10 January 2013, aged 97 years. At the age of 23 years she first set foot on African soil when she came to Nigeria. Fourteen years later she married Dr Ona Oruwriye and they had four children and adopted two others. Her husband had a hospital at Oke-Ado. Mrs Oruwariye, or Auntie Katie as she was known to everyone in the SMA, was a wonderful woman, full of faith. She was a gifted teacher of English – her students at the Nigerian College of Arts, St Anne’s College, St Theresa’s College and at the Ss Peter & Paul Major seminary, all attest to her teaching skills and kindness. Her Christianity was not mere words but also action. In 1962 she was the driving force behind a Home for Motherless babies, next door to the OLA Hospital in Ibadan. Mrs Oruwariye was also involved in several other charitable organisations in Ibadan. On the occasion of her 90th birthday she used it as an opportunity to raise funds for cataract operations for the poor. 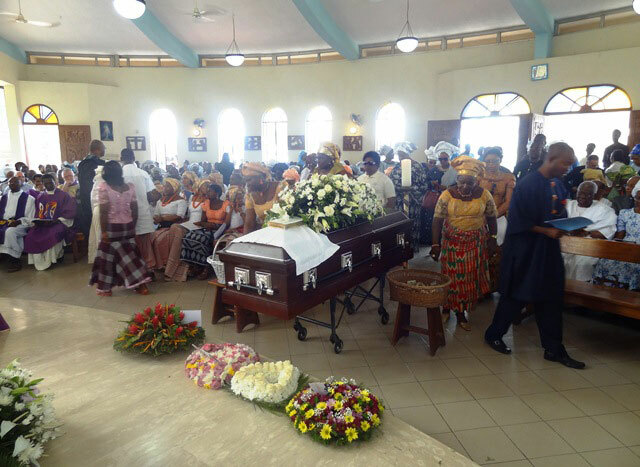 At her request, her Funeral Mass was celebrated at the SMA Chapel in Bodija, Ibadan on Friday, 1 February, attended by large numbers from all walks of life: politicians, doctors, those from the legal profession, businessmen, former ‘motherless babies’ whom she assisted and were now university graduates. Up to a short time before her death she attended Mass in the seminary chapel and was a familiar sight to all and sundry saying her private prayers and devotions. His Grace the Archbishop of Ibadan, Most Rev Felix Alaba Job was the Principal Celebrant, assisted by the Bishop of Oyo, Rt Rev Badejo. Also concelebrating the funeral Mass were many SMA and diocesan clergy whose lives Mrs Oruwariye had touched in so many different ways. Among the SMA priests present were Frs Edward Muge (Rector of the SMA House of Formation), Francis Rozario (staff member), Noel O’Leary (former Rector of the SMA House of Formation), Fr Francis Barka-Nado (Vice Superior of the Bight of Benin District-in-formation), Fr Trinkson Debres, John Suakor, Benjamin Ubi, Emmanuel Zinsu and Tim Cullinane who preached the homily. Read Fr Tim’s homily here. Among the OLA Sisters present were Sr Mary Anthony, Sr Agnes Hassan, Sr Victoria (Maryhill School), Sr Josephine (Matron of Oloyuro Hospital) and Sr Bridget from the OLA Novitiate at Maryhill. 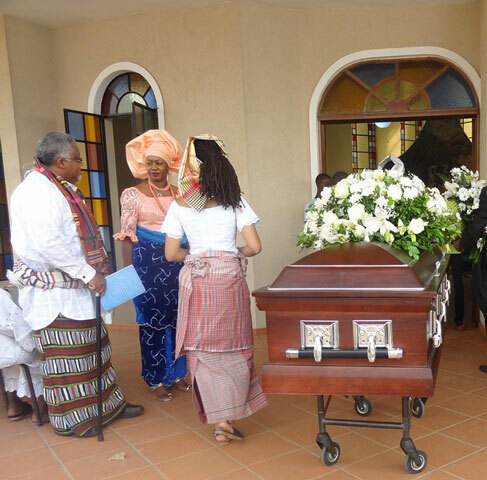 After the funeral Mass Mrs Oruwariye was buried in the beautiful garden of her house at Oruwariye Close near Challenge, Ibadan, where she often used to entertain visitors, among them many SMAs who are no longer in Nigeria. One of her great friends, Fr Damian Bresnahan, was one those no longer in Nigeria who enjoyed Auntie Katie’s legendary Lemon cake in the same garden where she now rests until the Resurrection on the Last Day. Auntie Katie, from your place with God, continue to pray for all of us who continue our earthly pilgrimage. Previous articleDon’t let the fire go out!